The insights may be based on data from a fruit flies, but the the differential effects of high vs. low taurine / caffeine ratios on wake-, respectively sleepfulness concur with my own N=1 experience. It's been a while since we've had a cup of the former Brew of the King's together. Therefore it occured to me that it would be high time to brew not just but three refreshing cups of hot coffee... ah coffee / caffeine news for us. If you feel that's way too much, you may avoid one of them, but the way I know the average (=extraordinary ;-) SuppVersity reader, you will have downed them in less than 2 minutes, anyway and if you are lean and healthy the average effect is, as the first and good news is going to tell you will have little but beneficial effects on your ability to keep just that. Too late? 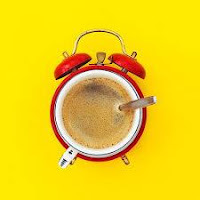 I mean, you're afraid it could keep you up, then I suggest you start with #3 of today's coffee-potspourri and learn how taurine could help you sleep like a baby despite the energizing effects of caffeine. And if you are one of the healthy skeptics out there, who are (rightly so) unwilling to believe that even something as delightful as coffee could have exclusively beneficial effects, you may like the taste of the 2nd cup from today's coffee party best. According to a recent study from the Wakayama Medical University School of Medicine in Japan (this is actually important, because much of the previous epidemiological data on the beneficial effects of coffee consumption comes from the Western world), two distinct models of multivariate regression analyses yielded almost identically beneficial inverse associations with visceral fat mass, visceral to subcutaneous fat mass (p<0.0001; no typo!) for those 330 study participants (average age 36–61 y) who consumed either 1-3 (low) or 4+ cups of coffee on a daily basis. Moreover, Kanae Murae and colleagues observed a favorable tendency toward these associations with total adiponectin and high molecular weight adiponectin levels in (P<0.06 bzw. p<0.07) in the moderate coffee consumers (just a reminder: 4 cups + was still considered "moderate" in the study at hand). Interestingly, these associations became statistically significant in those participants who did not already suffer from metabolic syndrome and are thus particularly relevant for the average non-obese, non-metabolically deranged physical culturist who's trying to stay just that: Lean & healthy. For participants with risk metabolic syndrome risk scores >2, on the other hand, did not benefit from either the "low", nor the "moderate" ingestion of caffeine and - I can tell you that without even needing a study to prove it - certainly not benefit from ingesting even more coffee. Why is that? Well, think about what coffee does: It squeezes the fat out of the cell and reduces it's reuptake and de novo genesis by temporarily reducing glucose sensitivity. Since the latter effect is mainly a function of the increased amount of free fatty acids and triglycerides in the blood stream, which is in turn driven by the caffeine induced increase in catecholamines and lipolysis, the same thing that will be beneficial for lean, active people with low baseline FFA and triglyceride levels and the ability to burn those fats in the mitochondria of their muscle while they work out (and even while they sit around), will compromise the glucose and fatty acid metabolism of an obese, sedentary person even more. Bottom line: In the end, it does all come down to the old adage of "Just because it's good for your neighbor, it must not necessarily be good for you as well!" In many previously discussed cases, this was the case for stuff that's highly beneficial for your obese neighbor, but in this case, it's the other way around: If Mr. Average Overweight American from next door mirrored your "moderate" coffee consumption (personally I can only repeat my previous recommendaton to stay below the 400mg/day margin, to play it save), he will - at best - experience no effects at all. In the worst case, it will exasperate his already existing insulin resistance and precipitate him to further metabolic derangements. Where there is light, there must be shadow. Some shadow, namely the non-existence of the beneficial association between low to moderate habitual caffeine consumption and total, as well as high molecular weight adiponectin levels, has already been mentioned in the Mure study. A recently published study from the Universityof Sao Paulo does yet suggest that there may even be real downsides attached to the consumption of coffee... paper filtered coffee that is to say. Bottom line: Even if we consider increasing cholesterol levels as being a sign of impeding heart disease, the mere fact that the "healthy participants" had a mean of "only" 27.0 +/- 3.8kg/m² and body fat levels of 29.1% and 37.5% in the male and female participants, respectively, would warrant another reiteration of the "obese neighbor" mantra... and let's be honest, you don't really believe that the subjects in the dozens of epidemiological studies indicating that regular caffeine consumption has beneficial effects on heart health drank only true Italian espresso, do you? And even if they did - the study at hand does not imply that this would not entail similar increases in in cholesterol and inflammation in the not so skinny, but certainly pretty fat participants of the study at hand, right? While the results are not new - the pertaining study by Lin et al. is from 2010 - I am pretty sure that few of you will have heard about it. On the other hand, I bet that you may have been asking yourselves, why Red Bull & Co. contain an agent that is a mild GABA agonist - shouldn't that make you sleepy instead of spiking you up? Or is it rather like the "energy drink" producers say that it "mitigates" or even "promotes" the energizing effects of caffeine? If we assume that human beings work anywhere similar like fruit flies (which is obviously hilarious, but not 100% unlikely, if we put an emphasis on "anywhere", here), then the data Lin et al. collected at the University of Pennsylvania, would suggest that the net result only depends on the dosage. If the ratio of taurine to caffeine is high the net effect will be sedative. If, on the other hand, the ratio of taurine to caffeine is low, the aforementioned money printing business men would be right. The unfortunate news, is yet that an increase in locomotor activity in the presence of a decrease of total sleep quantity does, as the researchers themselves point out precipitate "sleep deprivation and subsequent attention deficit in the long run". Whether that in turn can, or I'd better say, should be countered by taking even more taurine to "shut you down" after the spike is questionable and would in the end lead to the usual broscientific vicious circle of using supplement B to counter the side effects of supplement A... I mean, what's supplement C gonna be then? You can't seriously assume that B won't have side effects, as well, right? Bottom line: While it would obviously be hilarious to assume that the exact same ratio that works for the fruit flies will work for human beings as well, it is certainly enlightening to see that (a) a ratio dependent does in fact exist and (b) that the "optimal" ratio of 12.5 units per taurine per unit of caffeine happens to be present in Red Bull, as well - and that despite it appears that the Carolina and Pennsylvania State scientists are among the few people who are not yet on the payroll of the omnipresent red bulls. Corrêa TA, Rogero MM, Mioto BM, Tarasoutchi D, Tuda VL, César LA, Torres EA. Paper-filtered coffee increases cholesterol and inflammation biomarkers independent of roasting degree: A clinical trial. Nutrition. 2013 Mar 16. Lin FJ, Pierce MM, Sehgal A, Wu T, Skipper DC, Chabba R. Effect of taurine and caffeine on sleep-wake activity in Drosophila melanogaster. Nat Sci Sleep. 2010 Sep 24;2:221-31. Mure K, Maeda S, Mukoubayashi C, Mugitani K, Iwane M, Kinoshita F, Mohara O, Takeshita T. Habitual coffee consumption inversely associated with metabolic syndrome-related biomarkers involving adiponectin. Nutrition. 2013 Apr 16.